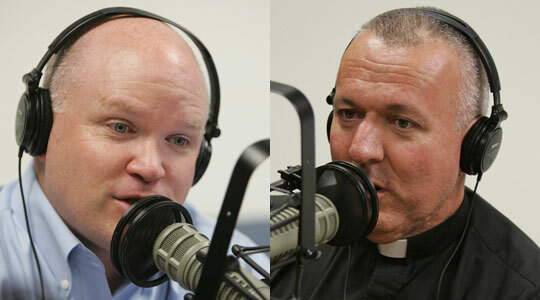 Summary of today’s show: Scot chats with Fr. Thomas Foley who oversees the largest part of the Central Ministries of the Archdiocese as the secretary for pastoral life and leadership. They dicuss the various ways the Archdiocese provides support to clergy and laity and assists parishes in their day-to-day efforts and planning for the future. 1st segment: Scot welcomed everyone to the show. He said today the archdiocese says goodbye to our current vicar general, Fr. Rich Erikson, and tomorrow say hello to Msgr. Robert Deeley, who will become vicar general and moderator of the curia. He will be on the show on September 9. Scot explained that moderator of the curia helps organize the rest of Cardinal Sean’s cabinet secretaries and coordinate their efforts. The cabinets include administration, education, faith formation, communications, health services, social services, institutional advancement, Catholic media, and the parish life and leadership. Fr. Foley is an episcopal vicar and he is the only vicar in the cabinet apart from the vicar general. A vicar represents or stands-in for the ministry of the bishop. Some dioceses have more than one vicar general. There is a judicial vicar, who is Fr. Mark O’Connell in Boston. Episcopal vicars are less common and he is the bishop’s delegate over a certain area of church life or people. Fr. Foley is the vicar for clergy and parishes. The other episcopal vicar in Boston is Fr. Arthur Coyle who is the Cardinal’s representative to the Merrimac region. A vicar has ordinary power, as canon law puts it. The bishop is the ordinary and the vicar can sign certain documents and take certain actions on the Cardinal’s behalf. 2nd segment: Scot met Fr. Foley in 2006 at the consistory in Rome at which Cardinal Seán was made a cardinal. At the time he was pastor of St. Ann in Neponset. Fr. Foley was born in Woburn, like many priests of the archdiocese. Cardinal Medeiros called Woburn the land of priests. He was baptized at St. Mary, Winchester, and celebrated his first Mass at Immaculate Conception, Winchester. His first assignment as priest in 1986 was St. Mary and Martha in Lakeville. When he was ordained, he got his assignment and said he’d never heard of Lakeville, which is on the far southern edge of the archdiocese. He was only there for three years. His next assignment was St. Eulalia in Winchester in his hometown where he stayed for five years. It was very busy with 1,500 kids in CCD. Four priests lived in the rectory. In a very unusual move, he was moved to St. Mary in Winchester for four years. He was then offered Immaculate Conception in Winchester, his home parish. He was there for 6-1/2 years until it closed in 2004. Scot asked how they dealt with the closing of the parish. They knew they were very small and that their finances wouldn’t work to keep them open. He told the people that the closing affected him as much as them; he had celebrated his first Mass at that altar. From there, he moved to St. Ann in the Neponset section of Dorchester as pastor. He was there only four years before Cardinal Sean asked him to come to the new assignment. Scot said Cardinal Sean might have looked to Fr. Foley because of his role in the formation of Pope John Paul II Catholic Academy, which gathered together 7 Catholics into one. Fr. Foley said in Dorchester, people even today identify themselves by what parish they come from, so merging the schools was very difficult. At the time, St. Ann was the largest school, but the budget was twice revenue very year and he and the other pastors recognized that it was impossible to make it on their own. Scot said it wasn’t easy but in the end it achieved what they hoped, which was the preservation of Catholic education in Dorchester. Fr. Foley said he wasn’t at first convinced about the merger of schools, but he was invited to a meeting in Brighton with the people behind the 2010 Initiative for Catholic education which gave him a lot to think about. After thinking long and hard, praying about it, and talking to his people, he became convinced. He stayed on the board of JPII academy for about a year after he moved to the Pastoral Center. He began his new assignment in June 2008 right as construction began on the new school and went back at the beginning of the school year for the opening. He missed St. Ann and not being a part of the new academy, but he was impressed by the excitement of the kids and parents in their new school. 3rd segment: Fr. Foley actually worked for a month in Brighton before the move to the Pastoral Center in Braintree. His position in the secretariate was created new by Cardinal Sean as part of a reorganization of the Archdiocese to strengthen services provided to clergy and parishes and focus on evangelization and faith formation. Among the offices are Clergy Personnel, which gives priests and deacons their assignments. Fr. Tom said it’s a strategic and important part of their service. They have a personnel board that meets to look at parishes that need a priest, look at available priest, and look at the surrounding parishes to make recommendations. They have regular meetings with Cardinal Sean to update him on the latest information and changes. Fr. Michael Medas is the head of that office. Scot said Clergy Personnel also provides pastoral care for priests. It includes direct support for priests who have immediate needs, one-on-one care they provide. The Cardinal often wants to get personally involved as well when there is a priest in need, such as with a death in the family. The same with the vicar general’s office. His secretariate helps with the ongoing formation of priests, including preparing parochial vicars to be pastors, ongoing education and formation, and more. Fr. Tom recently added Sr. Lucille to his staff to work with Fr. Medas in planning ongoing formation programs, workshops, conferences, the annual convocation, and retreats. There are also three or four priests per year who go on sabbatical, such as at the Pontifical North American College in Rome. Officially, a priest takes a sabbatical every 10 years, but in practice few of them ask for sabbatical. They don’t leave their parishes. The Vocations Office sponsors vocations to the priesthood as well as promoting the other vocations in the Church. They are bringing in many seminarians to study for the Archdiocese. There are about 60 seminarians for the Archdiocese right now. There’s another class of permanent deacons about to be ordained in September. The Office of Permanent Deacons is concerned with their formation and ongoing care. The Office of Pastoral Planning works with many in the parishes including pastoral associates in the parishes as part of the planning effort to strengthen parishes. Scot said the most important initiative in the Archdiocese over the next 5 years is pastoral planning for a stronger archdiocese given changing resources in the future. There is a lot of coordination among different departments and offices on a variety of committees that involve pastoral planning to get a wide perspective on the whole. This week’s winner is Anna Malinauskas from Waltham, MA. Congratulations Anna! 5th segment: Fr. Foley also oversees the the care and support of senior priests. Fr. FOley serves on the board of Regina Cleri, which he says is the finest home for senior priests in the country and many dioceses don’t even have a residence for senior priests. It was founded by Cardinal Cushing who had the foresight of building Regina Cleri when the West End was demolished for urban renewal. About 50 priests live at Regina Cleri, mostly those who are older and need more care, for whom living in a rectory is not practical. They have a good dignified life and a close community. Some senior priests also live in their own homes as well. The last office is Ecumenical and Interreligious Affairs. Ecumenical is among other Christian churches and interreligious is relations with Jewish and Muslim groups. It was founded by Cardinal Cushing and the office is overseen by two priests who are also pastors.